1. 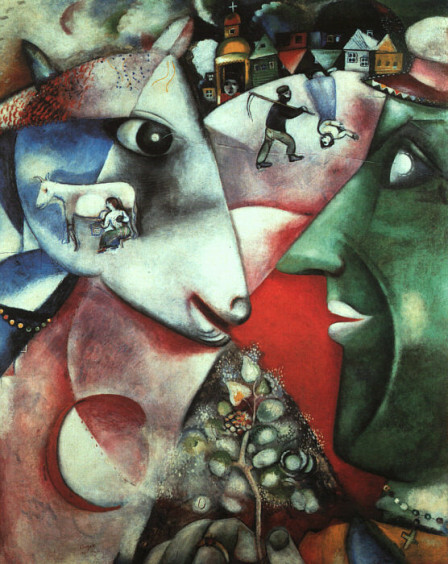 I and the Village is an oil on canvas painted in 1911 by Russian-French artist Marc Chagall. 2. It evokes Chagall’s memories of his native Hasidic community after leaving for Paris in 1910. 3. The painting contains seamless integration of various elements of Eastern European folktales, both Russian and Yiddish. 4. The overlapping images produce a dreamlike landscape in a continuous space. 5. Among the many elements, the green-faced man is a portrait of Chagall himself. 6. This piece made in a whimsical style was seen as groundbreaking. 7. The geometries of I and the Village are inspired by Cubism. 8. As most of Chagall’s paintings got lost or destroyed, it is one of Chagall’s earliest surviving works. 10. I and the Village is exhibited at the Museum of Modern Art in New York.